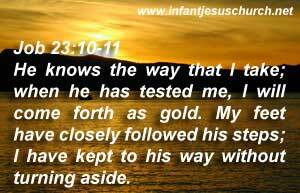 Job 23:10-11: He knows the way that I take; when he has tested me, I will come forth as gold. My feet have closely followed his steps; I have kept to his way without turning aside. Heavenly Father, we love you, Creator and Sustainer of our Universe, we confess our sins and our inadequacy in following your paths. Forgive us as we recommit our life to serve you in holiness and joy. Thank you for your grace which covers our sin and perfects in us the character of Infant Jesus whom we love the most. Through him we pray. Amen. But God knows the way that we take - margin, is with us. That is, we have the utmost confidence in him. Though we cannot see him, yet he sees us, and he knows our integrity; and whatever people may say, or however they may misapprehend our character, yet he is acquainted with us, and we have the fullest confidence that he will do for us justice. How we long for this to be our true confession. We are not yet gold, but long to be. We are not yet fully following his steps, but are trying. We have tried to not turn aside, but we sometimes hesitate. Thank God for his grace until our intentions and desires are fulfilled in our discipleship.